Class or location tracking in QuickBooks Online Plus enables you to monitor all your income and expenses. It also lets you to run reports for different locations or segments of your company. You can make use of any of these features alone or use them together, according to your reporting needs. To know more about these features in QuickBooks read the article further or call QuickBooks Support. How to turn on class tracking or location tracking in Settings? STEP 1: Click on the Gear icon at the top and then select Account and Settings (also called Company Settings). STEP 2: Choose Advanced from the left. STEP 3: Click on the edit (pencil) icon appearing in the categories section. STEP 4: Choose the category and select the settings for that category you want to enable. STEP 5: Click on Save. PLEASE NOTE: As soon as you turn on this feature, a drop-down menu appears on your forms for classes and locations. For more information on location tracking on sales forms, call QuickBooks Support. How to create class or location categories? STEP 1: Click on the Gear icon at the top and then select All Lists. STEP 2: Select Classes or Locations. STEP 3: Click on New at the top. STEP 4: Now, enter the important information. By selecting Add New from the Class or Location drop-down menu on your forms, you can add a new class or location. By doing this you will only be able to add name. You can edit or set up the location list, if you need unique form information for this location. If you want to add or modify classes or locations, you must have the appropriate custom user access rights. Please contact your master administrator if you are unsure of your access rights. How to Edit or delete class or location? • After editing the information you wanted to edit, click on save. PLEASE NOTE: After completing the above mentioned steps successfully, the location and class will be removed from the Classes or Locations list or updated with the desired information. How to make an inactive location active? STEP 3: Click on the Gear Icon present above the Action column and then choose Include Inactive. STEP 4: To activate the location or class, select Make Active from the list. 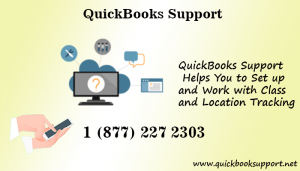 For more information on class and location tracking call QuickBooks Support at 1-877-227-2303.